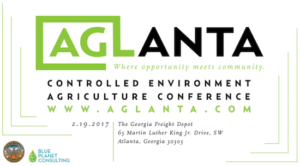 ATLANTA – The Aglanta Conference is a gathering to showcase urban and controlled environment agriculture (CEA) innovation in the City of Atlanta. The City of Atlanta has partnered with Blue Planet Consulting to bring together restaurateurs, grocers, architects, entrepreneurs, technologists, business owners, and urban farmers for this premium networking and knowledge sharing opportunity. Our goal is to foster Atlanta’s growth as a central hub in the nation’s $9 billion a year indoor farming industry. The Aglanta Conference will be an intimate and invaluable environment for participants to engage with a local, national, and international audience. Through workshops, lectures, and networking sessions, the conference will cover issues across the spectrum of urban agriculture business models and technologies, with a particular focus on the emerging field of vertical/indoor farming. We will spotlight local champions already doing incredible work growing food as means of ecological restoration, social cohesion, cultural preservation, economic development, and biopharmaceutical development. Atlanta is the perfect location for agribusiness to set root. It is home to business-friendly environment with abundant and affordable workers, innovative technology resources, and thought-leaders in the burgeoning urban agriculture industry. Aggressive population growth projections coupled with the quality of life benefits the City of Atlanta has to offer creates the ideal setting for work in the urban agriculture industry. As of December 2015, Atlanta is one of a handful of cities with an Urban Agriculture Director, dedicated to working on food access generating policy, advocacy, and development. Cities and companies from around the world are tapping into the promising and emerging field of urban and vertical agriculture. They have proven that locally sourced produce is not only healthier and more sustainable, but also that it can also be highly marketable and lucrative. The Mayor’s Office of Atlanta, like other indoor farming industry leaders, recognizes the positive health and community outcomes from this budding industry, and thus is co-organizing the Aglanta Conference. For more information about the Aglanta Conference, please visit http://www.aglanta.org. Follow the Aglanta Conference on Facebook @Aglanta. Follow the Mayor’s Office of Sustainability at @ATLSustainable.